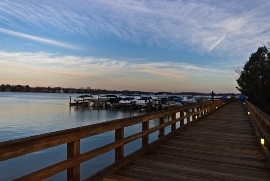 Both the Bluff Point area is a popular waterfront luxury location on Lake Norman. Convenient to just about everything in the Lake Norman this area incldes some of the most sought after waterfront property on the lake. A popular location for tear downs. Captain’s Point is a small enclave homes located in the town of Cornelius on beautiful Lake Norman. These fine homes are built by well known and award winning custom home builder Simonimi Custom Homes. In addition residents enjoy water views, outdoor living area’s, and deeded boat slips. The builder describes these homes as a vacation whenever you are home!